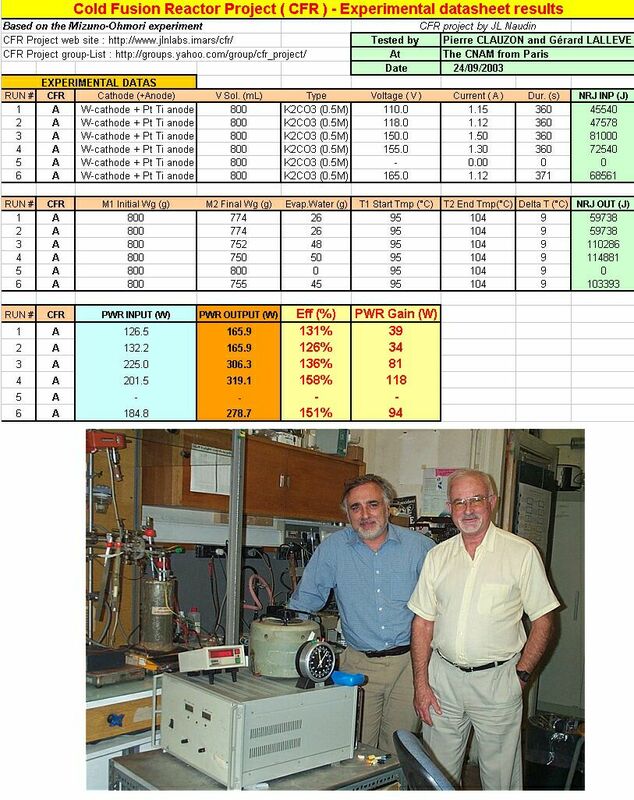 The Cold Fusion Reactor ( CFR ) experiment has been replicated successfully by Pierre Clauzon and Gérard Lallevé at the CNAM laboratory ( Conservatoire National des Arts et Métiers ) from Paris. A Dewar vessel filled with 800 mL of a Potassium Carbonate ( K2CO3 ) solution at 0.5 M has been used. Six tests runs have been conducted and an efficiency up to 158% has been measured for a power input of about 200 Watts with a net power gain of 118 Watts ( see the full tests results below ). 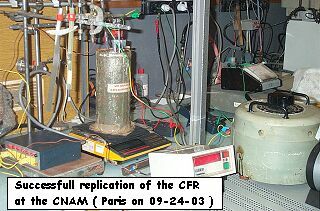 I am very grateful to Pierre Clauzon for his contribution to the CFR project and his help during some CFR tests runs and also to the Professor Jean-François Fauvarque and Gérard Lallevé from the "Laboratoire d'Electrochimie Industrielle" of the CNAM ( Conservatoire National des Arts et Métiers ) from Paris, for their scientific support and their contribution to this project.